It only took me 4 years to put it together haha. Lets just say decor is not my strongest suit but I managed to finally create a space that I love. 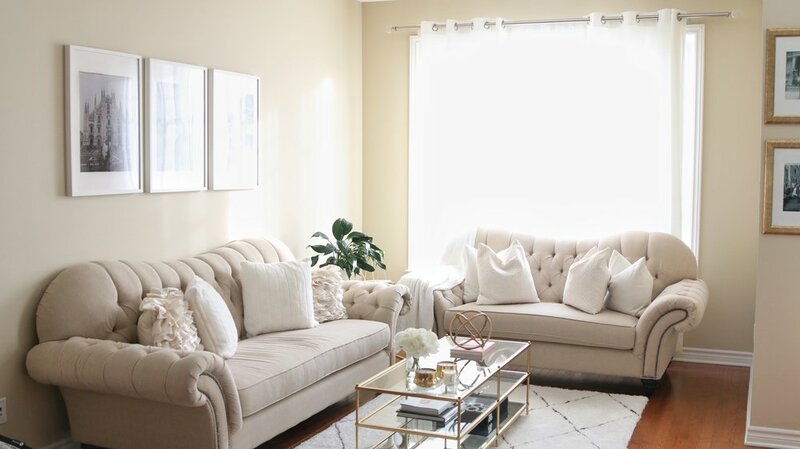 I went for a transitional style living room to create an elegant and timeless vibe. 1. Neutral colours, such as creams, taupes, dark browns, black. This makes for a serene and clean look. The only pop of colour I have in the room is the gold which still falls under the neutral tones. 2. 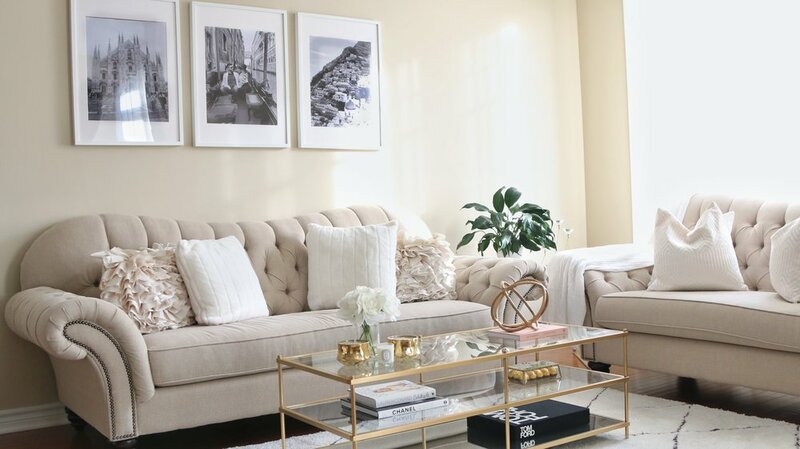 Tone-on-tone color palette: The beige walls, furniture and pillows. There is something sophisticated about tone on tone. Think of how effortlessly chic a co-ord outfit looks. 3. Contrast is highlighted through textures or tones: The white picture frames on the wall contain black and white photos . I chose black and white to add some contrast to the room. All three photos are from my trip to Italy in May 2017. Adding a sentimental element to a room makes it cozy and definitely a talking piece for visitors. 4. Fabrics & Textures: Adding textural elements to a room is eye grabbing. The throw pillows include silk satin, fur and suede and an added cotton throw blanket. 5. Curves & straight lines combined: Curvy tufted sofa combined with a sleek glass coffee table with smooth gold metal legs. 6. Minimal accessories: My coffee table decor was definitely inspired by Pinterest! I added some popular coffee table books, candles and simple decor items like a floral vase and an eccentric gold decorative piece. I linked some of my living room items below or similar items if I could not find it online. Let me know what you guys think! I would love to hear about your ideal living room style. Comment below if its contemporary, transitional or traditional.